Whenever a new toy line comes out that reminds me even a little bit of the ones I collected when I was a kid (and still collect), I can't resist picking up at least a few. My most recent toy discovery of this kind is Crashlings, a new series by Wicked Cool Toys that I first became aware of when it was shown at Toy Fair 2014 earlier this year. Crashlings are billed as "Meteor Mutants From Outer Space! ", and are probably most similar to another current mini figure line, The Trash Pack. In fact, I'm sure their existence owes more than a little to that line's popularity. As with the The Trash Pack, Crashlings features "fun," somewhat "cute" designs and sculpts of creepy and strange characters. Another way Crashlings are similar to The Trash Pack is the fact that the figures are broken out into separate groups. 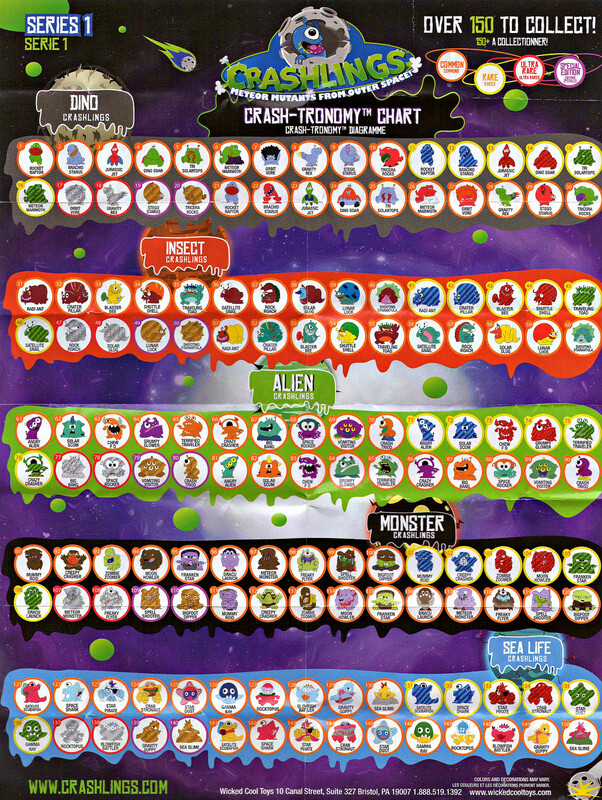 The five Crashlings groups include Dinos, Insects, Aliens, Monsters, and Sea Life. However, unlike The Trash Pack, figures from each Crashlings group are packaged separately, so you know what you're getting (although there's still an element of surprise, since some of the sculpts are hidden in the packages). 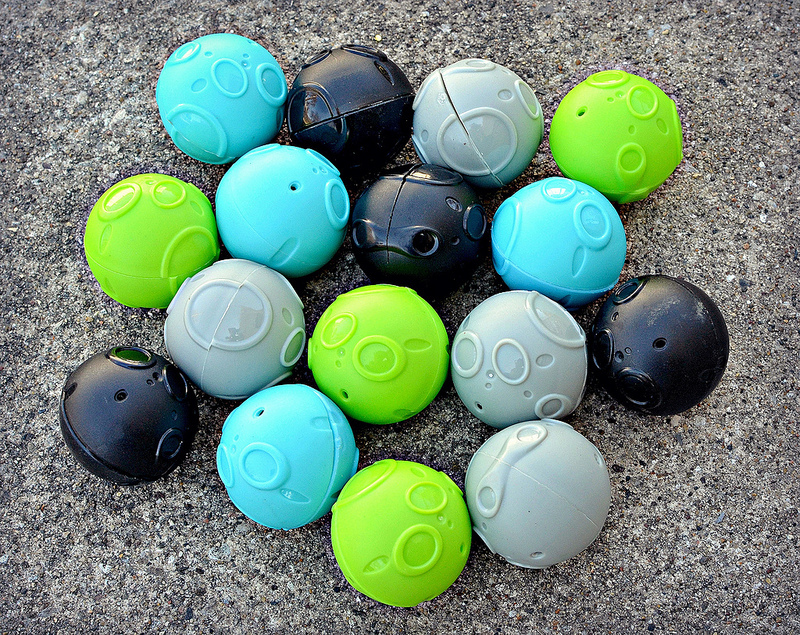 One of the line's main selling points to kids is that each Crashling comes with a "meteor" pod they can be stored in, some of which have one soft rubber half that can be used to pop them up to four feet into the air. The meteors vary in color depending on which Crashlings group they go with. The colors include black (Monsters), green (Aliens), gray (Dinos), red (Insects) and blue (Sea Life). Each figure is one inch or under, and while you might expect them to be squishy like Trash Pack toys, they're actually made out of hard plastic. The basic figures have multi-color painted details, but the line also offers chase and variant figures in solid, monochromatic colors such as gold, silver, metallic red and metallic green. 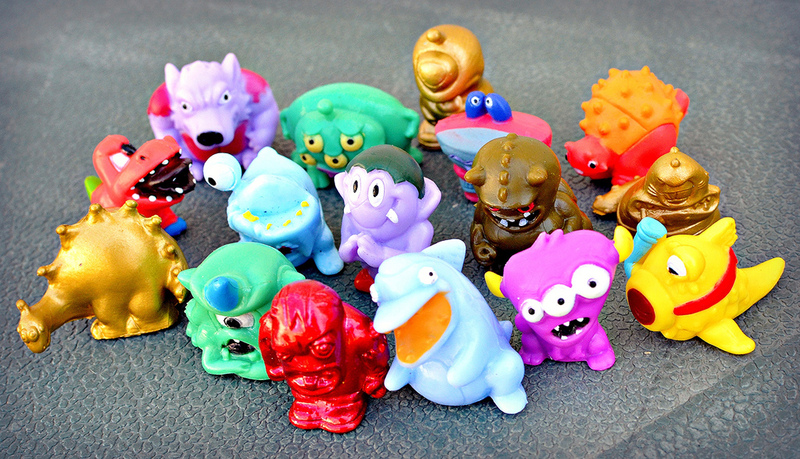 As with The Trash Pack, Crashlings figures are separated into various levels of rarity. This includes "common," "rare," "ultra rare," and "special edition." There is over 150 different figures to collect, but this includes color variations of some of the same sculpts. 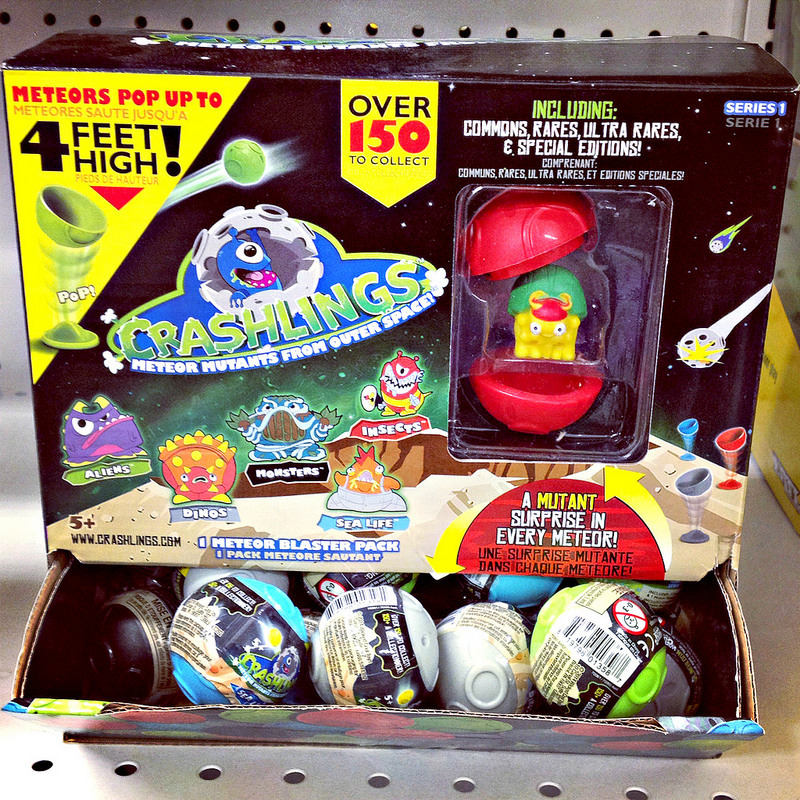 Crashlings are sold a few different ways: single-packs, including one meteor with one hidden figure, 4-packs, with two Crashlings visible and two hidden in packages, and 10-packs, with five visible and five hidden. Certain figures are exclusive to the various types of packs. So far, I've only seen them available at Toys 'R' Us, stores, but I'd imagine they'll be sold at other stores in the future. From what I can remember, Toys 'R' Us has them priced at $2.99 per single pack, $5.99 per 4-pack and $9.99 per 10-pack. In addition to the figure packs, a "Catapult City" playset has been released. 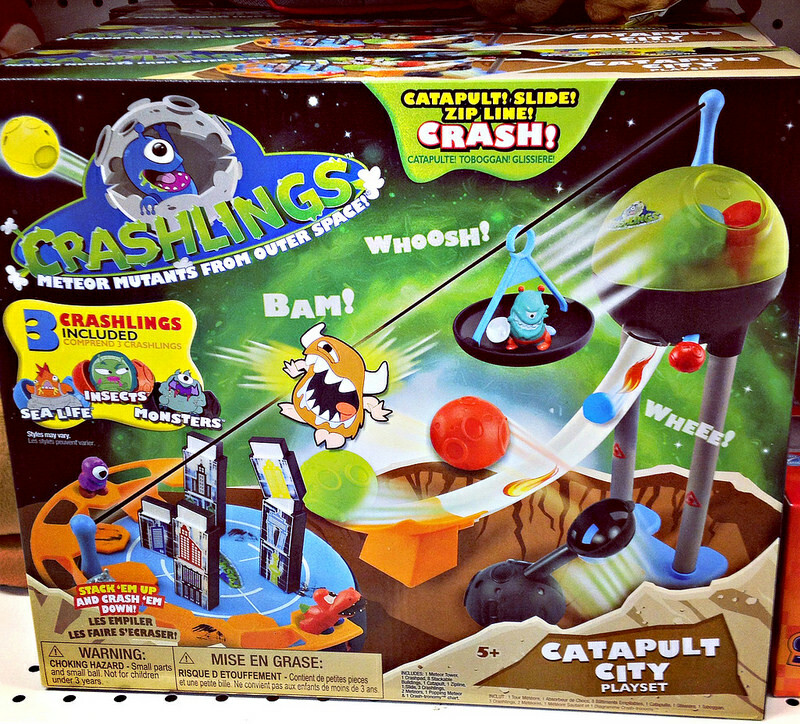 The set includes a catapult, slide and zipline for the Crashlings, as well as three figures. Overall, Crashlings is a pretty fun and well thought-out line. I kind of wish they avoided taking the "cutesy" route with the character designs, but for what it sets out to be, the line is quite successful. I like the fact that it is broken out into different character groups and allows you buy them individually, so if you decide you just want to collect the Monsters and Aliens, for example, you could do so. I also like that monochromatic variants are available. What do you think of Crashlings? Have you picked any up yet, or do you plan to? I actually like the design of these better than the Trash Pack stuff this really has more of a old school 80s vibe with them which is great! I see what you mean by that...they are a bit more "old school" in style, which is a good thing. I bought two of the individual ones on a whim today just because the little meteor things looked kinda interesting. One of them was a limited edition Dino (#50 of 100) and it has this really sweet purple flocking on it. I found a robot t-rex today. I like the meteor container. I can use them for props in my toy photography.